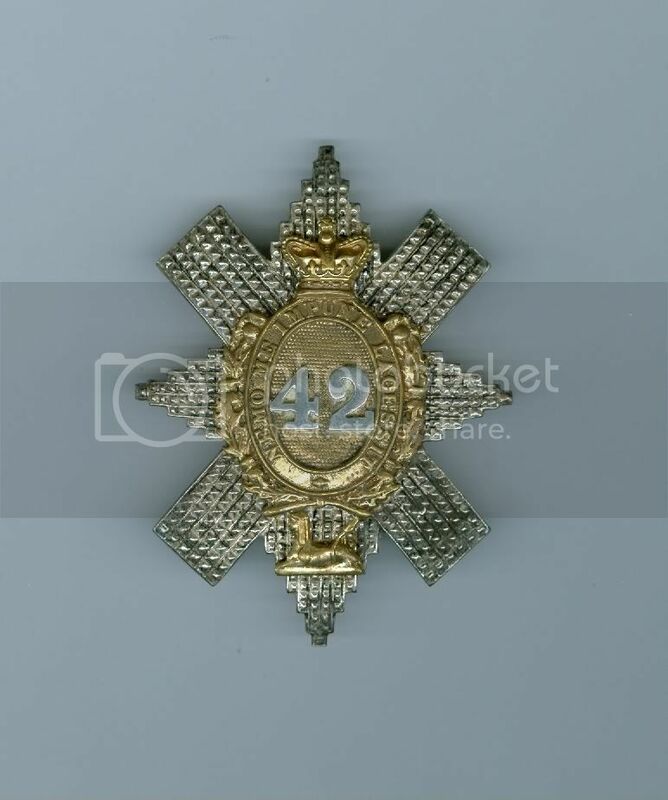 42nd Foot officers glengarry badge. Silver back star with gilt overlay seperate silver numerals. 1875-1881. Welcome Ron to the official Black Watch Site,There is a lot of people here who have not seen your collection of photohraphs, badges ect,I look forward to seeing them again. 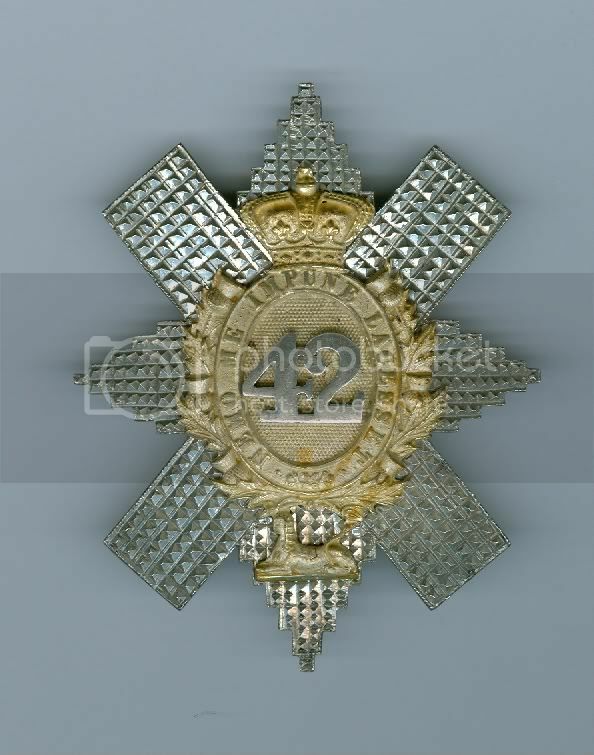 42nd officers glengarry badge, cast silver plated back star gilt overlay with separate silver numerals. This version has a pinched Victorian Crown and makers name plate to the reverse. W.Anderson Military Outfitters Edinburgh 1875-1881. Welcome to the site and thanks in advance for posting your collection. Considering that the images have been resized the detail, clarity and quality is really good. Thanks for the welcome all, I see quite a few names on here I recognise. Hope you enjoy my collection am always interested in comments from members. The descriptions and dates I give are only my opinion always happy to be corrected. My collection includes 42nd Foot, Black Watch, Royal Highlanders of Canada and Transvaal Scottish. 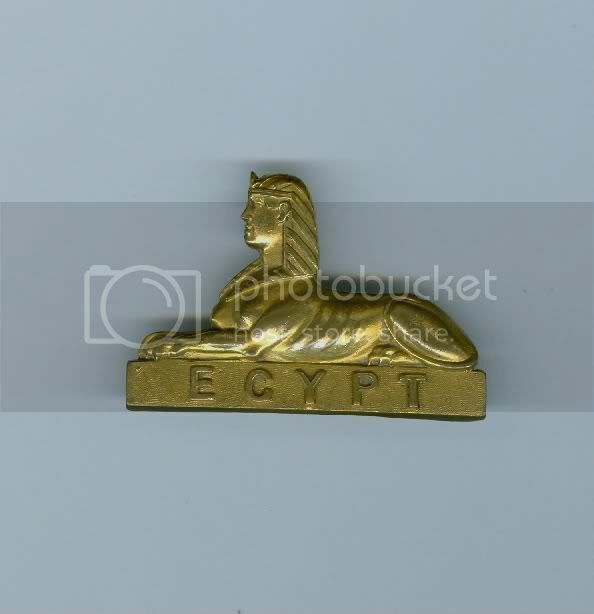 A fine and early officers bonnet badge being a die-cast copper gilt sphinx with fine reeded mantling and asp diadem headband. Retaining 80% fire gilding with lead soldered replacement lugs to the rear. Circa 1860. Greetings Ron, nice to see you on Site, you have no idea how often I look at the pictures of your collection which you sent to me a few years ago. I am still looking for Black Watch postcards etc. Hi Bob, nice to hear from you again you can view some of my WW1 B.W. postcards on the Great War Forum in unit and formation threads. This site is in for a real treat viewing your extensive collection Ron , like Joe I have followed all your posts and enjoyed them . Aye Tam, I agree M8 - Keep them coming Ron!